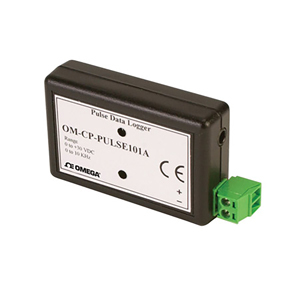 The OM-CP-PULSE101A is a low-cost recording device that will sense a pulse input or contact closure from external sources such as transducers or pulse initiators (gas, water, and electric meters) and transform those inputs into engineering units. In addition, this data logger allows the user to store user defined units such as gallons/min into the device as well as scale factors and offset values. This enables the user to easily linearize and scale any transducer that provides a pulse or contact closure output to any user required units automatically.